Homes sales were down in January from the previous month, likely a result of the severely cold weather which affected many markets more than in typical years. Inventory levels remained tight but did increase slightly. The weather may have affected the number of listings coming onto the market, but we still ended the month with 149 more homes on the market. The decrease in sales pace and tightening of inventory is reflected in the moderate price decrease in January, however, prices are still up year-over-year. Low inventory and sustained price gains throughout 2013 has left individuals looking to sell in a great position heading into the New Year. New mortgage regulations that took effect in early January may slow the buying process in the beginning of 2014, but those looking to buy this year will want to take advantage of rates and prices as early in the year as possible as both continue to follow an upward trend into 2014. On January 29 the Federal Reserve announced it would continue to curtail its nontraditional asset purchases in February, as the strength of the economy continues to improve. As the Federal Reserve draws back its level of asset purchases, mortgage rates will likely continue to slowly increase. Recent turbulence in emerging markets may be having a dampening effect on mortgage rates as investors move heavily into U.S. treasuries, driving down yields which will have the effect of lowering other interest rates. 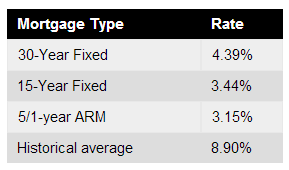 Currently, Freddie Mac reports the following figures: 30-year fixed rate, 4.39%; 15-year fixed rate, 3.44%; 5/1-year adjustable rate, 3.15%. The year-over-year sales pace in December was down. The annual pace of sales in January was 657 homes, down 4.5% from last year and down 18% from last month. Surprisingly, Coop sales were up year-over-year in January, while Condos and residential single/multi-family home sales were actually down. The median home price increased 4.6% year over year in January, according to the Long Island Board of Realtors, to $375,000. From December, prices were down 2.6%, which is usual for this time of year and consistent with the tight inventory levels reported. The price gains of 2013 have returned thousands of homes to positive equity and positioned their owners to participate in the market for the first time in years. 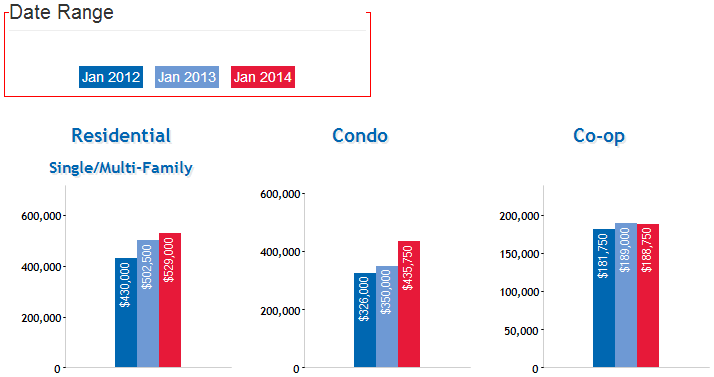 Residential & Condo home prices continued to increase, while Coop home prices decreased slightly year-over-year. January marked a slight increase in inventory month to month with the overall number of houses available for sale rising from 5,190 to 5,338. Months of supply, which reflects both the number of houses available and the current pace of sales, rose from 6.3 to 6.6 months. Year over year, however, inventory is still down. 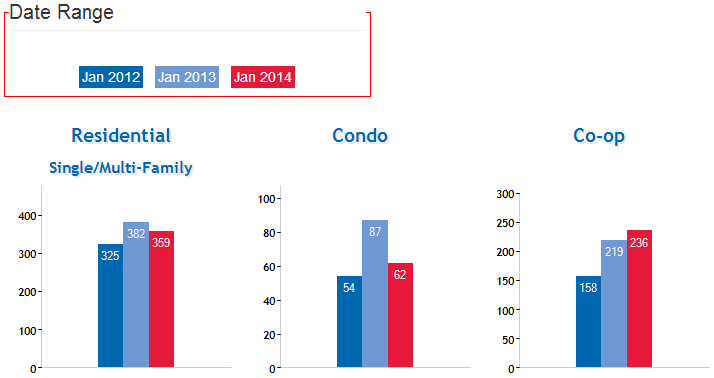 The colder-than-usual January weather likely has had an impact on inventory levels in Queens.